The historic 2015 meeting between Xi Jinping and Ma Ying-jeou made a third alternative, beyond unification or separation, more likely. Taiwanese President Tsai Ing-wen spent some time addressing the cross-strait relations in her National Day speech on October 10, accusing China of using coercion to challenge the status quo in the Taiwan Strait. It was no surprise that she avoided mentioning the 1992 consensus, but another term missing in her address deserved more attention: “dialogue.” She sought “new modes of cross-strait interactions” in last year’s speech, but in this year’s address no similar term was found. Tsai may have lost her patience in pleasing her mainland counterpart. Just hours later, China criticized Tsai as a provocative separatist whose antagonistic thinking against China would lead Taiwan to a more dangerous situation. For Chinese President Xi Jinping, the 1992 consensus is the bottom line of his Taiwan policy, without which he would not engage with any dialogue or interaction with his island counterpart. These developments may disappoint James Moriarty, a top American diplomat on Taiwan affairs and chairman of the American Institute in Taiwan, who expressed a wish to see a constructive dialogue between China and Taiwan at the Double Ten commemoration in Washington D.C. Stability in the Taiwan Strait would serve American interests, but Moriarty’s wish sounds like a luxury at the moment. If one remembers, however, the status quo was totally different three years ago. 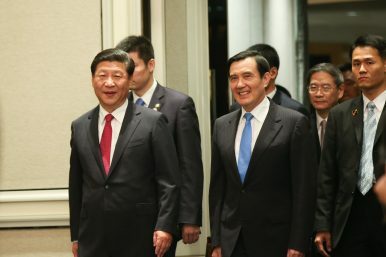 The first leaders summit between Presidents Ma Ying-jeou and Xi Jinping was held in Singapore on November 7, 2015. Despite setting a precedent, it looked like a flash in the pan even at the time, with Ma due to leave office the next year. Bilateral ties soured six months later, and the return of a diplomatic competition broke the eight years’ truce. When the military tension arises again in the Taiwan Strait, it would be wise to rethink the peaceful remedy once suggested in Singapore. The fast-changing atmosphere in cross-strait politics made it easy to overlook the significance of the Singapore summit. Beyond culminating a rare period of stability, this historic meeting may be the lighthouse to steer China and Taiwan away from approaching the edge of war. For both regimes, the mutual denial of sovereignty has long been the major obstacle preventing their leaders from meeting since 1949, when they separated from each other. Nevertheless, the joint protocol reached in Singapore contained a secret code of peace that made creative arrangements to avoid sovereignty pitfalls. Without this protocol, a quasi-normal relationship between two sides may find no basis. There are three elements indispensable in this peace protocol. First, the venue. A venue implying no political superiority is indispensable, but the dilemma is that neither China nor Taiwan can meet this requirement. The Chinese leader would prefer a venue on the mainland — Beijing, Shanghai, or Hong Kong — since these venues might carry a message that Taiwan is a domestic matter. This is however the worst-case scenario for any Taiwanese leader. That explains why President Ma, when holding his party’s chairmanship concurrently from 2009 to 2014, avoided attending the annual party forum initiated by the Nationalists (or Kuomintang) and the Communists since 2005. He could not afford risking the island’s dignity should he be downgraded to the status of a local governor in a trip to the mainland. Exceptionally, there was one time Taiwan would have consented to a mainland venue: The leaders’ summit at the Asia-Pacific Economic Cooperation (APEC) meetings held in November 2014 in Beijing. With an equal-participating platform guaranteed by APEC, Taiwan could ease the worry of national discrimination should its leader visit the rival’s capital. Ma proposed just that to his mainland counterpart months beforehand, but Xi eventually turned down this idea in fear of setting a precedent for Taiwan to attend other international meetings held in China thereafter. The first chance was lost. Taiwan would prefer a venue somewhere under its control. Hosting at home can secure an equal stance, let alone home court advantages. Instead, China would bear the risk. During 2000 to 2008, then-President Chen Shui-bian invited then-President Jiang Zemin twice and Jiang’s successor Hu Jintao once to come to Taiwan but received no replies from them. The last Communist Party leader to travel into the rival’s realm was Chairman Mao Zedong during the Chongqing negotiation with Generalissimo Chiang Kai-shek in late 1945, four years before the Communist regime established the People’s Republic on Tiananmen Square. Since then, no Communist leaders have dared to take the risk that Mao did. Therefore, meeting at a third place becomes the only feasible option. It is absolutely fine for Taiwan. Yet China may still fear that a foreign venue may present the world an image of two co-existing Chinas. In accordance, despite Ma’s clear nonseparatist stance, Xi’s final consent to the Singapore venue was widely regarded as the biggest concession in terms of sovereignty that China had ever made to Taiwan after the end of the civil war. It is noteworthy that the first cross-strait quasi-summit, via white gloves, was also held in Singapore in April 1993. Back then, the meeting was between Chinese senior politician Wang Daohan and Taiwanese business tycoon Koo Chen-fu, both of whom chaired a foundation authorized by each government responsible for mutual interactions. Although a proxy meeting was less symbolic, the 1993 Singapore talk may have set a good example inspiring the second occurrence in 2015. Both leaders’ presidential title represents each side’s sovereignty, but is also an insult to the other, due to the overlapped claim of territory. “Mister President” is a taboo term for officials to address the other side’s leader on formal occasions. This created a funny but real anecdote: In November 2008, Chinese envoy Chen Yunlin came to Taiwan for the first time in response to the island’s new rapprochement policy. When presenting a gift of a painting to Ma, Chen avoided using the official title but only addressed the president as “thou” — a more respectful form than “you” in Chinese — making for an odd conversation. Tsai Ing-wen, then the leader of the opposition party, condemned this de-titled appellation as demeaning to Taiwan’s sovereignty. It did not take long for both presidents to agree on dropping each presidential title for their first meeting. Being addressed “Mister” abroad must be something new for Xi, so it was his second concession to Taiwan in Singapore. As Ma’s spokesperson at the time, I sat in the same room witnessing the smile on Xi’s face when Ma addressed him as “Mister Xi” 10 times in the one-hour meeting. Likewise, Xi addressed “Mister Ma” 12 times. The third essential piece is the presence. An equal presence in all aspects of protocol is critically necessary. Parity and dignity are conditions that a Taiwanese leader cannot afford to lose in front of their Chinese counterpart. During the preparation stage, China revealed high tolerance to all equal-footing arrangements Taiwan proposed. The first handshake required both leaders to walk toward each other to meet in the middle of carpet as hundreds of cameras flashed. Entering the meeting room shoulder-by-shoulder, they sat across a long table and spoke in turns. In the evening banquet, the two leaders sat side-by-side at a round table and split the bill of meals. All these step aimed to avoid the impression that there was a host leader while the other was a guest. Another prominent part was the press conference after the bilateral talk. Xi did not show up at China’s conference, which was hosted by Zhang Zhijun, the top official in charge of Taiwan affairs, with a large audience of 500 journalists from global media. Later in the same room, Taiwan’s conference was hosted by Ma himself. When I opened up the conference as his spokesperson, I first welcomed all present to join “President” Ma’s conference. Fourteen journalists raised questions in the half hour and 11 of them began with a respectful address of “Mister President.” Meanwhile, the table card showed off Ma’s presidential title with a national flag on the top. Evidently, Taiwan was not shy from presenting its sovereignty and democracy to the world in this joint protocol. 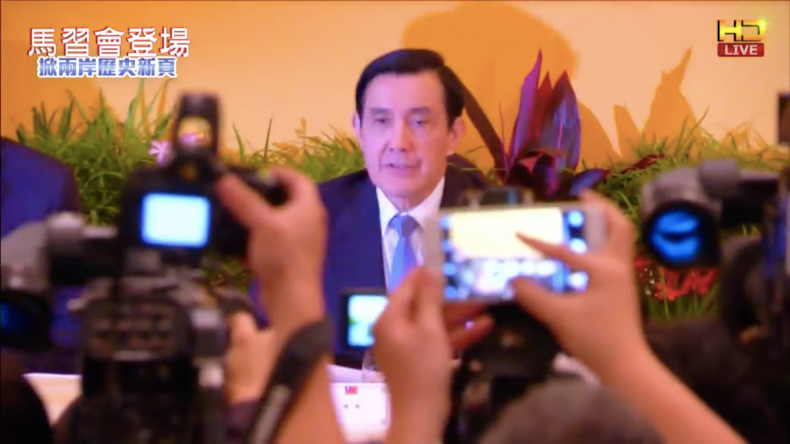 In this screenshot of a news broadcast of Ma Ying-jeou’s press conference, the flag on his table card is clearly visible. These scenes from the press conference were soon broadcast on China’s national TV news without censorship on the contents or any alteration of President Ma’s table card. It is fair to say that accepting the domestic and international display of Taiwan’s sovereignty symbols in front of the Chinese people was another big concession from China. Some significant pieces of the Singapore summit are explicit. The two presidents signed no agreement or joint communique, but their meeting proved itself a de facto “peace agreement without words.” Both regimes agreed to establish mutual trust based on the 1992 consensus as a political common ground. Beyond unification or separation, a third alternative emerges: A peaceful coexistence for two long-term rivals across the Taiwan Strait becomes possible. However, one point of significance went missing. Few were aware that the leaders meeting furthermore transfigured the nature of the 1992 consensus. As a real context, the Singapore summit embodied this consensus of discourse, giving the spirit a tangible body. The 1992 consensus has long been regarded as a political discourse that concluded the fact that both sides set aside differences and reached common understandings and acknowledgements in 1992. Tsai has reiterated her understanding and respect to this “historical fact” as her best gesture of goodwill to China since she became president. Yet Tsai’s refusal to admit that those understandings or acknowledgements in history were aimed at the “one China principle” undermined her to the Chinese. It sounded like a don’t-say-it game for this lawyer president, whereby she described the 1992 consensus on occasions but without saying the actual words. In contrast, the Singapore protocol of the leaders summit turned the word game into a reality. That both leaders avoided using the other’s presidential title recognized an existing territorial dispute between the two, meaning that both sides still upheld “one China” discourse in the meantime. The equal presence of two regimes in a third place gave flesh to the idea of “different interpretations,” making a vivid display for a theoretical discourse that may have long confused many. In fact, China and Taiwan reached a new consensus in 2015. The Singapore protocol was the incarnation of the 1992 consensus. It is just like the movie script was written in 1992 and the film was first screened in 2015 with President Ma and Xi as actors. It also implies that this script can be re-screened anywhere again and again. The Singapore protocol set an unprecedented stable structure in the geopolitics of East Asia. It serves the interests of all who prefer peace over war for this region. Taiwan survives under China’s concession while the United States can stand away. To be frank, it may be the best result that Taiwan can possibly get if China would never recognize the island’s eventual separation. No signs show that any mutual trust has so far been accumulated between this pair of leaders. Tsai may believe that her positive understanding and acknowledgements to the historical fact that talks happened in 1992 is the furthest she can go. Xi may insist that the 1992 consensus is the final bottom line in his Taiwan policy. Accordingly, they could never meet each other unless one were to yield from their current stance. Nevertheless, a slight chance remains. Although the gap between two leaders is significant, it is not a big gap in actuality. Their current stances surrounding the 1992 consensus are not really far from each other. A little more flexibility or creativity may do the trick as long as either party is willing to change their mind. Dr. Charles I-hsin Chen is a research fellow in Centre for Rising Powers, University of Cambridge and a non-resident senior fellow in Institute for Taiwan-America Studies in Washington D.C. As the spokesperson to President Ma Ying-jeou, he joined the leaders meeting in Singapore and hosted the press conference in the summit. What Does the 1992 Consensus Mean to Citizens in Taiwan? Hint: it’s not what either Taiwan or China think it means. 'Sky Row' Calls for Debates on China in TaiwanCalm Down About Taiwan’s New PremierTsai's Refusal to Affirm the 1992 Consensus Spells Trouble for TaiwanTaiwan: 1992 Consensus on Shaky GroundWill the Ma-Xi Meeting Backfire for Taiwan's KMT?